In a pan add little ghee ,cashew nuts fry it until golden brown then add raisins.Keep it aside. In the same pan add rava and fry it . In a medium size pan add 2 ½ cup water add Cardamom powder and color. 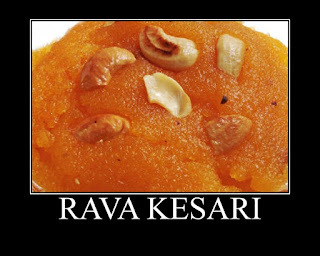 When it’s started boiling, add rava and mix well. Keep mixing then add sugar and mix well with out lumps. After 30 secs turn off the stove.